Your strobe produces a harsh light unless it is diffused, The closer the subject, the harsher the light, and the greater the need to soften it. The Lightfuze diffuser was designed to create a larger source of light. The Lightfuze diffuser has many features that make it a good choice. Here are some of the differences and advantages. The Lightfuze is small. Fits easily into your bag, even in the small compartments. 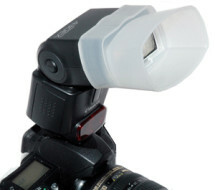 Fast and easy to attach to your strobe. No Velcro. Custom fit to your strobe. Stays tight without falling off. The Lightfuze diffuser creates a very soft light. The light is thrown around the room much as the lampshade fills the room with soft light. Open top diffuser – While diffusing the light and spreading it around the room you now have the ability to bounce off the ceiling. ( your largest source of light ) It is like having 2 lights for a transparent shadow or no shadow. The Lightfuze diffuser not only diffuse the light, it spreads the light as well. The coverage of the Lightfuze diffuser is wider than other diffuser due to it flair design. The Lightfuze color is neutral and keeps the color temperature normal. Other diffusers are milky in color or very big which will soak up light robbing you of power. The spherical shape will light the room 360 degrees while the open top bounces off the ceiling , your biggest light source. A must for serious photographers.